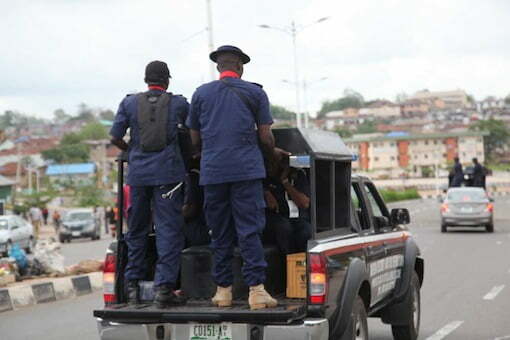 The Imo State Police Command on Thursday paraded an official of the Nigeria Civil Defence Corps (NSCDC), Imo Command, Mrs Gloria Ogbonna, 35, and her husband Chukwuma Ogbonna, 50, both natives of Umuoba,Umopara in Umuahia South Local Government Area of Abia State, for alleged gun-running. While parading the couple before journalists, the State Commissioner of Police, Chris Ezike disclosed that the husband was identified as a major supplier of arms to notorious kidnapper E-Money, who was killed during a gun battle with the police last year. According to Ezike, a team of the Special Anti-Robbery Squad (SARS) in course of their investigation of a kidnap case on February 4 swooped on the couple at their residential apartment at Area ‘N’, Zone 4, World Bank Housing Estate, Owerri, where some arms and ammunition were recovered. The Commissioner disclosed that the suspects have confessed to the crime as well as their involvement in the supply of arms and ammunition to some robbers in the southeastern state. Exhibits recovered from them include 79 pieces of cartridges, forty five rounds of .9 mm live ammunition, 118 rounds of K2 live ammunition, 2 Ak-47 (with empty magazines), 4 pistols, 17 long chief revolver live ammunition. Others are: eleven pieces of of AK-47 riffles covers, SMG magazine, AK-47 telescope, filling machine, electric shocker, Lar riffle stocking pin, military camouflage, pump action guns, and a double barrel gun.